It is the eighth robotics company that Google has acquired in the last half-year. Executives at the Internet giant are circumspect about what exactly they plan to do with their robot collection. 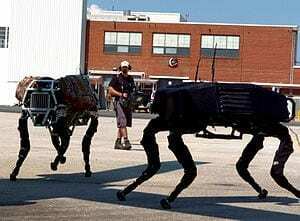 But Boston Dynamics and its animal kingdom-themed machines bring significant cachet to Google’s robotic efforts, which are being led byAndy Rubin, the Google executive who spearheaded the development of Android, the world’s most widely used smartphone software. April 18, 2019 - Upward Bound robotics team heads to World Championship Daily Journal OnlineOn Tuesday night, a send-off party was held at Mineral Area College for a robot and a group of students headed to the World Championship in Texas. April 18, 2019 - NCHS robotics team heads for World Championships New Canaan AdvertiserThe New Canaan High School robotics team in New Canaan, Connecticut is headed to the World Championships. April 16, 2019 - Google robotics could focus on navigation, machines moving from place to place CNETRobots that run and jump are “crowd pleasers,” the company's robotics chief said. April 18, 2019 - North Delta robotics team set to take on the best in the world Cloverdale ReporterSeaquam Secondary's robotics team is headed to Kentucky for the Vex Robotics World Championships.